2014 Doqi, Kisi Qvervi, Kakheti, Republic of Georgia. Recent finds and historical evidence puts Georgia at the heart of the birth of the wine trade, it is believed now that Georgian wine dates back 8,000 years, making it the oldest wine region. Truth be told, borders were not drawn as they are now and whether it was present day Georgia or Armenia or what is now Turkey may never be truly certain, but it looks as it was here, in the foothills of the Caucasus Mountains. The Qvervi, a clay vessel used to ferment and store wine, is a Georgian invention that is now on the UNESCO World heritage list of cultural items and is an iconic symbol of ancient winemaking, not just in the past, but it is now finding a home in Western and modern winemaking from Europe to Oregon, and California along with it’s little brother the terracotta Amphora, though in Georgia the Amphora is used only to transport the finished wine, not make it, the Qvervi, which is buried in the earth, is Georgia’s tool of choice. Also, for a long time we though of Georgia as a red wine making country, though in fact, something that I learned recent at a brilliant seminar given by Lisa Granik MW, it is white wine which is most made/grown in Georgia, with grapes like this Kisi, and Mtsvane, as well as the most widely planted varietal Rkatsiteli. 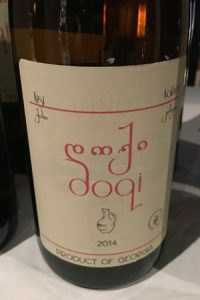 The Doqi Kisi Qvervi is a skin contact white with lovely aromatics and fine texture with tannic vibrancy and slightly cloudy showing a light pink/yellow tint, it is an “Orange” wine, though not as savory or as wildly funky as some, this would be a great way to start your exploration into Georgian traditional wine, Doqi also does the same wine without Qvervi, fermented in stainless, both lovely and fresh with the stainless much clearer and much more delicately crisp and mineral driven, but I adored the Qvervi with it’s exotic nature and spicy herb/anise bite. Green tea, minty fruit with lime, tangerine, white flowers, quince and stone fruits lead the way on the crunchy palate with hints of peach, dried orange rind and flinty stones make for an interesting wine with structure and racy/edgy character. It will take time to understand or get a handle of Georgian wines, Kekheti is the main growing region and it is very difficult to really tour or explore still with many places only accessible by foot, or 4X4 if you are lucky, there are many zones and terroirs, plus dozens of native varietals, as well as European grapes, study is on going. Importer Blue Danube brings in the Doqi wines, all of which are quality made and worth checking out, especially this Kisi made in Qvervi and both the Qvervi and oak aged red Saperavi wines, as well as the stainless (these whites taste more like Gruner Veltliner and or Albarino) and Qvervi Rkatsiteli. Georgia is a poor country, especially outside the cities, so every sold bottle counts, and the country is still rebuilding it’s wine industry from Soviet times and wars, both civil and with Russia in 2008, it will be intriguing to see what happens in the next 5 to 10 years, but even so it’s influence is spreading, whether it is in the “Natural Wine” moment or the use of Qvervi, you can see it in wines like COS in Sicily and Foradori in the Alto Adige, both owing their style to Georgian traditions. Look for the Doqi wines, they are a glimpse of the origins of wine and they are wines you can enjoy for their quality and pleasure.